The Cricro puzzles are flat-to-cube and flat-to-pentagon box puzzles. For promotional use we developed three different sizes. For each the thickness of the foam is determinant. There are large Cricro models of 6mm thickness (CC6), Mini Cricro's (CC4) with 4 mm and Micro Cricro's (CC3) are 3 mm thick. 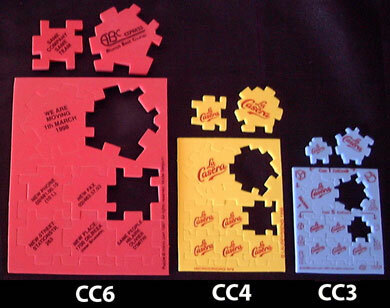 Promotional Cricro puzzles can be packed in different ways and printed instruction cards can be inserted. We can provide printed solutions to put on the website of the advertizer. © PlanetPremium/Dirk Laureyssens, 2002 - All rights reserved.